Whisk together milk, egg and butter, add to the bread pan of the Kuissential 2-lb Programmable Bread Machine. Add flour, sugar, salt and make a small well, to add the yeast. Select dough cycle (9)2 lb. Loaf and press start. When cycle has finished remove all dough and turn out on to a floured surface rolling into a rectangle. About 15"x10" , spread softened butter, and sprinkle, sugar and spices. Begin to roll dough up tightly starting on a long side. Press edges down to seal and form into a 12-inch long, roll. With a knife (non serrated) cut roll into 1 inch pieces. Place rolls into a greased 13"x9" pan. Cover and allow to rise 30-45 minutes OR cover and place in the refrigerator overnight to bake in the morning. If baking immediately after rising, place in preheated 375 degree oven and bake for 20-25 minutes until golden brown. Allow to partially cool before icing. 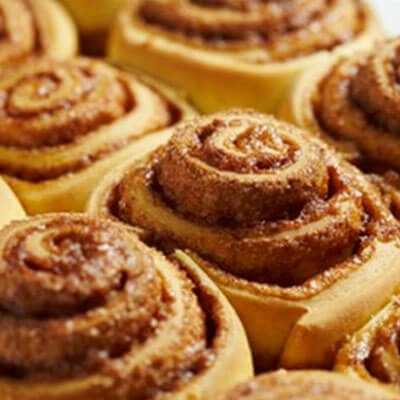 If chilling over night, remove in morning, preheat oven and allow rolls to come to room temperature. Then bake as directed above. Beat together cream cheese and butter, add sugar and continue to beat, add vanilla and 2 tablespoons milk, add additional milk, to adjust thickness of icing. Ice rolls. Kuissential Tip: Spray the breadmaker paddle with cooking spray to prevent dough from sticking!